Elizabeth A. 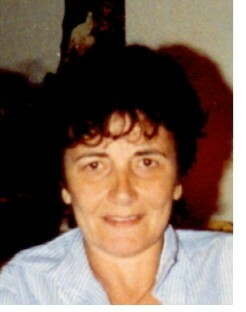 (MacDonald) Hazard, 73, of Milford, died Sunday, March 4, 2012, in the Blaire House of Milford. She was the wife of the late Robert A. Hazard who died in 1987. She was born in Milford daughter of the late Julia (Boni) MacDonald and was a life long Milford resident. Mrs. Hazard was a educated of the Milford schools. She was a communicant of the St. Mary’s of the Assumption Church. She was a strong and loving mother and grandmother and enjoyed her family. She is survived by three sons, Keith A. Hazard of Milford, Randy P. Hazard of Uxbridge, Christopher S. Hazard of Milford, four daughters, Debra E. Hazard of Milford, Terri E. Hazard of Fitchburg, Susan C. Hazard of Milford, Julia E. Hazard and John Caron both of Whitinsville, two brothers Harry MacDonald of Mendon, William MacDonald of Milford, ten grandchildren and six great-grandchildren. She was predeceased by her grandson Richard Garcia Jr. The funeral service will be held Thursday, March 8, 2012 at 9 A.M. at the Consigli-Ruggerio Funeral Home 46 Water St. A mass of Christian burial will be held at 10 A.M. in the St. Mary’s of the Assumption Church on Winter St. Burial will follow in the Parish Cemetery. Calling hours are Wednesday from 4 to 7 P.M. I love you Gramma and miss you I know you visit in my dreams and I love those visits. I love you always. Please take care of Samantha.